Bowling Green had a positive start against Miami last weekend. The challenge for the Falcons is to improve every week and play consistently well. BG split with the 10th-ranked RedHawks, winning Game 1 at home and losing Game 2 in Oxford. Both games ended in a 3-2 score. The Falcons played well for two periods in the first game and one period during the second game. The biggest issues for BG were too many turnovers and breakdowns in its defensive zone. BG returns to action Friday and Saturday when it visits Alabama-Huntsville (0-2) to begin the Western Collegiate Hockey Association portion of its schedule. The Falcons were third in the WCHA coaches poll and believe they’ll contend for the league championship. UAH: The Chargers lost 3-2, 4-3 at Colorado College last weekend, although they were outshot 85-44 in the series. “They’ll be energized and hungry and excited to be playing at home,” Bergeron said. UAH is rebuilding its program after it was nearly cut for financial reasons by school officials two years ago. Of the 20 Chargers to play against CC, seven were sophomores and five were freshmen. Sophomore goalies Matt Larose and Carmine Guerriero combined for a .918 save percentage against CC. The Chargers were 2-35-1 overall and 2-25-1 in the WCHA last season, but one of the victories was a 4-3 overtime win in BG Dec. 7. BG won the other game at home and swept a January series in Huntsville. Guerriero had 41 saves in the win at BG. WCHA: The BG-UAH series is just the second league series in the WCHA this season. The other saw Michigan Tech sweep Lake Superior two weeks ago. SIDELINED: BG junior forward Brent Tate won’t play this weekend, the result of a lower-body injury suffered in Game 1 against Miami. Tate, one of BG’s best players, tried to skate in practice Tuesday, but couldn’t and is no longer practicing. He was slowed by back and knee injuries during his first two seasons. COMPETITION: BG goalies Tomas Sholl and Chris Nell will make the trip to UAH, while junior Tommy Burke will not. WCHA rules allow teams to take only 22 players on a road trip. Bergeron said before the season all three would start one game during the first two weekends, meaning Nell will start one of the games at UAH. 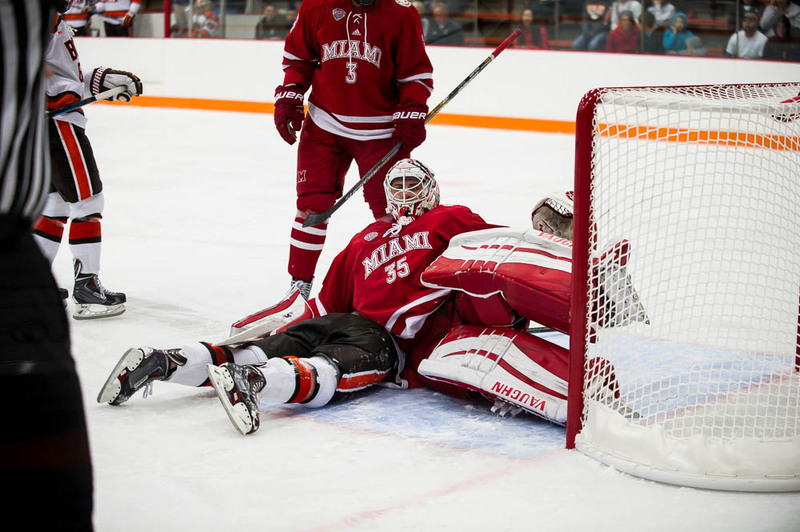 Sholl stopped 22-of-24 shots in the win over Miami, and Burke stopped 26-of-29 shots in the loss. PRODUCTION: Kevin Dufour continued to play well for the Falcons, scoring three of the team’s five goals against Miami. Two of the goals came on the power play. The sophomore forward played well late last season when he totaled nine goals and seven assists in 37 games. 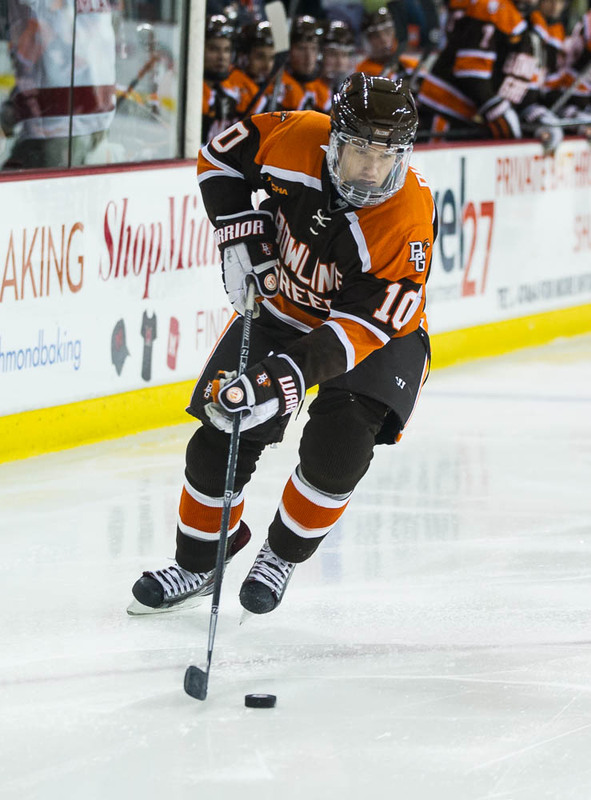 The 6-foot, 195-pounder was recruited to BG as a goal-scorer. He had 31 goals and 36 assists in 69 games for the Carleton Place Canadians in the Central Canadian (Junior) Hockey League during the 2012-13 season. PP: The Falcon power play was 3-of-11 against Miami and had scoring chances on all but two or three of those attempts. Both BG power-play units were effective. MORE PP/PK: The BG penalty-killing was good overall against Miami, allowing just one goal in six attempts. Against CC, UAH was 2-of-5 on the power play and 11-of-12 killing penalties. Last season, UAH’s power play converted at 8.8 percent, and its penalty-killing was at 70.5 percent. FAMILIAR FACE: Former Falcon goalie Jimmy Spratt is in his first season as BG’s director of hockey operations. He played at BG from 2005-09, and played four seasons professionally before retiring after the 2012-13 season. Last season, Spratt was a goalie coach in the Detroit area, working with goalies of all ages from young kids to juniors. “I made it my goal to move up through the levels of hockey with coaching in some capacity,” Spratt said. “When this position opened and they contacted me, I thought it would be a step in the right direction.